Now is the time to make the move to All-Flash. With the right combination of performance, price and density options, our broad portfolio puts flash within reach for any size organization, making 2016 The Year of the All-Flash Data Center. 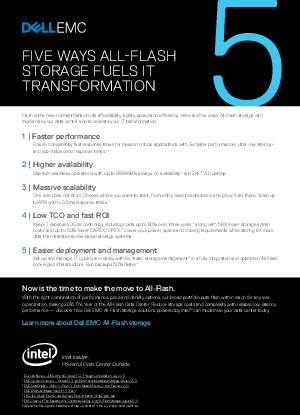 Reduce storage costs and complexity with reliable, low-latency performance — discover how Dell EMC All-Flash storage solutions powered by Intel® can modernize your data center today.